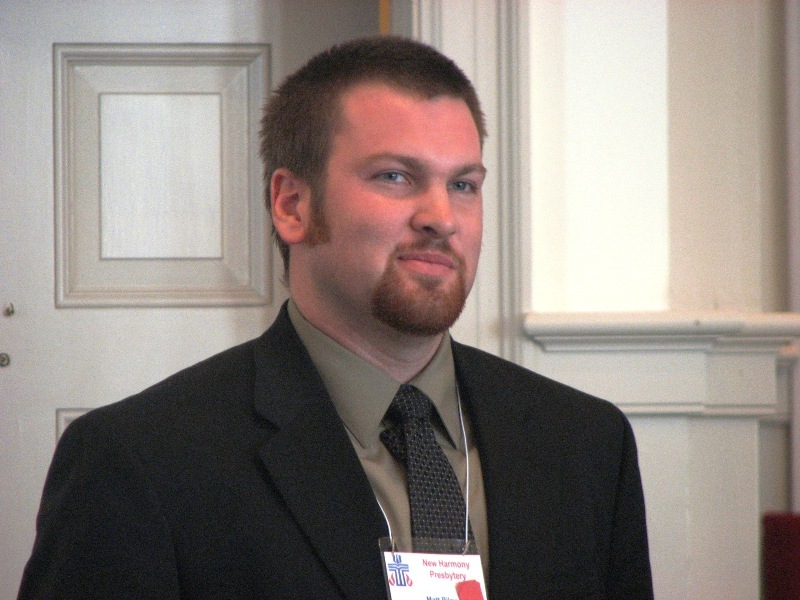 The Presbytery of New Harmony installed Matthew Riley as its Director of Camping Ministries during the Winter Stated Meeting, February 9, at the First Presbyterian Church, Myrtle Beach. The Director of Camping Ministries is responsible for the ministry at Camp Pee Dee as well as staffing the youth and older adult ministries in the Presbytery. We welcome Matt to the Presbytery of New Harmony. Churches were given packets containing information about the summer camping program at Camp Pee Dee. You may download the brochure with the registration form by clicking on the headline link above. Members of smaller membership churches of presbytery, this is for you. Saturday, March 29, 2008, at Camp Pee Dee your are invited to, "Come to the Table and Celebrate: A Gathering of the Wee Kirk of New Harmony Presbytery." Beginning at 11:30 am, the event will include lunch at 12:00 noon. A worship service, with communion, will follow lunch. Come and celebrate what is happening in your local congregation! The cost is only $7.00 per person. Contact Rev. Bill Byers, (843)378-3245, for reservations. Pastor’s Primer offers help with coping. The Presbyterian Handbook for Pastors, published by Geneva Press, offers information on things from call and administrative matters, to pastoral care and worship. It is a ready reference guide for ministry. The book offers helpful tips for all types of situations a pastor encounters with a dose of humor. To order The Presbyterian Handbook for Pastor, call (800)672-1789 or www.cokesbury.com. At the request of Giddings-Lovejoy, Presbyterian Disaster Assistance has responded to the shootings at the Kirkwood, Missouri City Hall. Several Presbyterian Churches have been affected. Some of those killed and injured were Presbyterian. Reminder-Board of Advisors roster needs updating. All churches have received a letter and form from Presbyterian Communities of South Carolina regarding the Board of Advisor Representative for their church and their Mother's Day Offering materials order. Please fill out and return the form asap so PCSC can update their Board of Advisor roster for our presbytery and order the correct number of Mother's Day materials for churches in our presbytery. Mary Knight Stuckey nominated for Outstanding Youth Leader Award. Congratulations to Mary Knight Stuckey of First Presbyterian Church in Hartsville, who was nominated by her congregation for the 2007-2008 Outstanding Church Youth Leader Award. This Award brings with it an annual scholarship of $500 for the time she is enrolled here at PC, but its meaning goes way beyond this, because the young people so honored are already living out the motto of PC “while we live we serve” in all they contribute in church and community. Columbia’s Ten Thousand Villages to close. The store, located at 4711 Forest Drive (Forest Park Shopping Center), will close on February 16, 2008. Ten Thousand Villages wants to thank all of its loyal customers for their devoted patronage during the past two years. All items in the store (except Equal Exchange coffees, teas, and chocolates) are marked down 25% through Feb. 16. Christmas items are 50% off. The store is open from noon to 5 p.m. Wednesday through Saturday. A non-profit store chain, Ten Thousand Villages helps fight poverty by paying artisans in 32 developing countries a fair price for their handmade wares. There are more than 160 Ten Thousand Villages stores in the United States. For more information, call the store at (803) 743-9500. Click on Presbytery Events to view information on Presbytery wide events. Click on Other Events to view information on local church and other events. Adobe Version available at adobe version. Need adobe reader. Visit adobe. If you have had an event at your church you would like to report or have an upcoming event to publicize in the Presbytery of New Harmony, send the information to avery@newharmonypres.org. Publicity of an upcoming event should be sent two weeks prior to the event. Contact us at office@newharmonypres.org or (877) 662-8411. Office Hours: 8:30 a.m.-6p.m., Monday-Thursday; 8:30-12:30, Friday. 14, Grand Strand area minister/educator lunch, Cedar Hill Landing, 12 pm. 19, Education & Nurture Division, Presbytery office, 4:30 pm. 20, Cheraw area Min./Ed. lunch, El Sherif’s, 12 pm. 21, Congregational Development Division, Presbytery office, 12 pm. 23, Resource Center Day, Presbytery Office, 10 am-2 pm. 27, Florence area Min./Ed. lunch, Red Bone Alley, 12 pm. 28, P.A.D.D., Presbytery office, 1 pm. Alice Grace Lowder, infant, Midway Presbyterian Church, brain surgery. Elder Rob Robinson, Midway Presbyterian Church, facing surgery.